July 2014: "Heart Paintings" in Atlanta! I'll be the featured artist at the Art Ministry gallery of the Episcoapl Church of the Epiphany in Atlanta, for the month of July. (See map below.) Please come if you have a chance, as most of the nearly 60 paintings I'm showing (about 25 framed, the rest matted and ready to frame) have not been exhibited anywhere else. 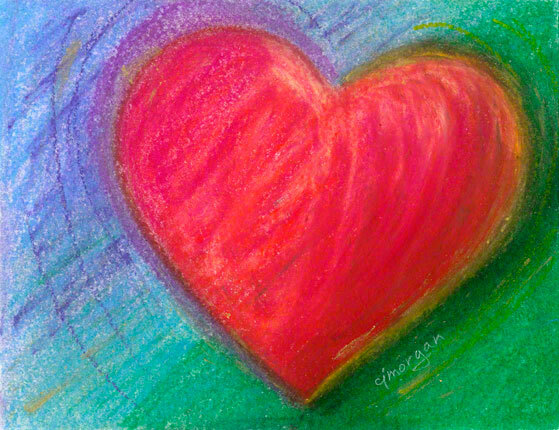 These small abstract oil pastels use color and the arrangement of symbols — especially the heart symbol — to explore relationships, life stories and the individual human heart. The paintings span the 7-year period during and after my care for my life partner, Marge Felder, through breast cancer, Alzheimer’s and ovarian cancer. Thus the paintings explore joy, memories of a long life together, conflict, grief, the challenges of creating a new life alone — and above all, the power of love. All the paintings on exhibit are original oil pastels, either framed or archivally matted to fit standard frame sizes. Purchase may be made by check or credit card, with 25 percent going to the church's ongoing art ministry program. Purchased paintings will be available for pickup at the end of the month. The Church of the Epiphany is usually open Mon. through Thur. from 9 till 5, on Fridays 9-noon, and of course on Sunday mornings. Of course it's also open many other times during the month whenever other church events are scheduled. (Check the online church calendar.) You can call the parish office at (404) 373-8338 during weekday hours to be sure the church is open. On Sunday, July 13, I'll be at the church to meet people between services, from 9:30 to 11 a.m. Of course you're welcome to come that morning even if you don't attend either service. I'd love to see you.